A large area detector without any dead space capable of handling a large dynamic range does not currently exist. Current large area detectors have dead zones created by abutting several modules together. These detectors are counting detectors, which are good only for low flux operations. Other integrating detectors currently being developed in Europe are also modular assemblies with dead areas and expandable in only one direction (as these are only two side buttable). 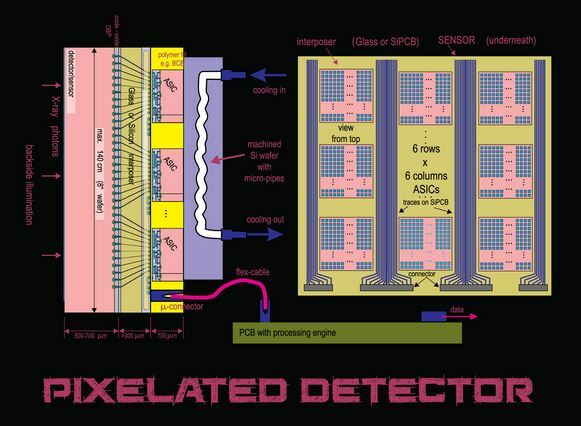 Fermilab has developed a large area, high spatial resolution camera system for detection of X-rays with pixels capable of handling signals of up to five orders of magnitude dynamic range and in-situ storage of images acquired at high speed (Multi-megahertz frequency). 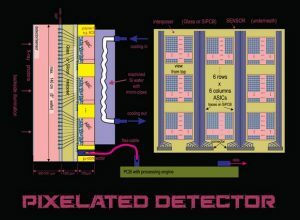 Fermilab’s High-Resolution X-Ray Camera System is a large area pixelated detector system up to 20cm x20cm with small pixel sizes on the order of 100-150μm (side) without any dead space. Each pixel can integrate a wide dynamic range charge of five orders of magnitude 1 fC to 100 pC from the detector that is equivalent to the range of 1 to 105 photons impinging on a single pixel at a multi megahertz frequency (6.5MHz). The system achieves both the required resolution at the low end and adequate dynamic range with good linearity. No other detector system exists which meets all the above specifications, as these are normally tradeoffs. The system has a wide range of applications from correlated X-ray spectroscopy, diffraction studies, pump probe, small molecule imaging, etc. The system could also prove useful for all types of position sensitive detectors, timing and energy spectroscopic detectors in High Energy and Nuclear Physics, Photon Science, and Material Science.